There are two main ways to enjoy tea cold. One is cold brewing (which doesn’t involve any hot water whatsoever and requires a little patience), the other is the traditional way to make iced tea, you brew your tea hot and pour it over ice to chill it (virtually instantly). Are you “team iced tea” or “team cold brew”? I’ve been on team cold brew for a while, so in honor of National Iced Tea Month, I gave iced tea a chance to shine. I came up with what could be imaginatively defined as a “tea mocktail”, or shall I say, my new favorite summer drink (and soon yours too). I love the way the combination of ripe strawberries, fresh thyme, vanilla and a hint of smoke enhance the black tea I’ve selected, a Taiwanese Sun Moon Lake black tea, whose notes of summer berries, wildflower honey and berry preserve are very distinctive. I named my creation “A midsummer picnic at Sun Moon Lake”, what do you think? I used my 5 oz gaiwan to steep the tea leaves for 1 minute / 1 minute 10 seconds at 200F and I made 2 subsequent infusions. While the steeped tea was cooling a little, I muddled the strawberries with thyme and 1 teaspoon syrup in my serving glass of choice. In a cocktail mixing glass (you can use a pitcher if you don’t have it), stir the tea with one large ice cube until ice is melted and tea feels cold. 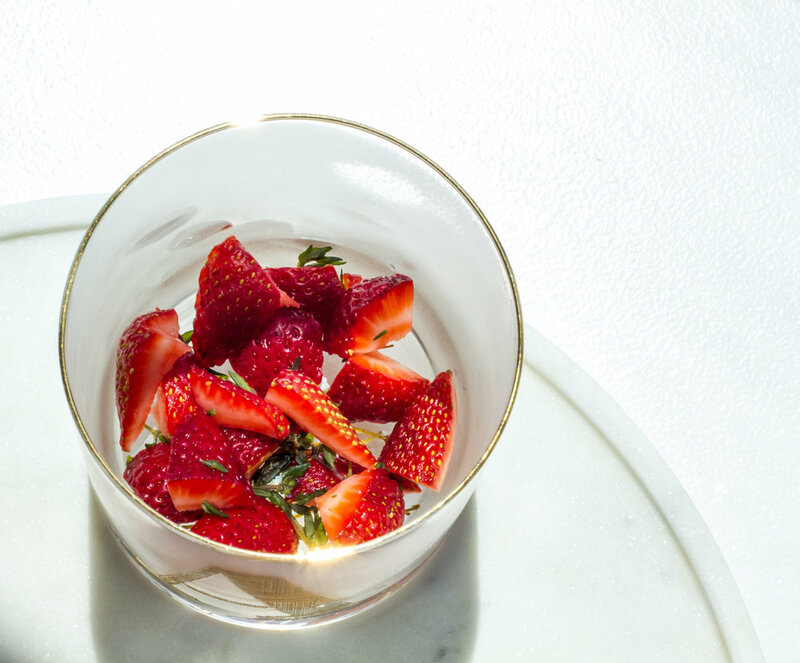 Pour the tea in the serving glass over the strawberries and add another large ice cube. Decorate the rim with a strawberry and enjoy straightaway.